Feelme Crew is a team of people, dealing primarily with video shooting and editing. There are many creative studios out there in this niche that are using a variety of materials for business cards. We decided to play with the shape, so that our design could pop out better. The very first design version (in process) was monolithic – the upper part of the clapper board was not moving at all. Then we designed some invitations ( for another client ) using the rivet technology and decided to go with the same method for the Feelme Crew business card design, too. The experiment was successful and actually not too expensive. We produced our cards with the help of two different companies – one which did the printing and another one, specializing in bookbinding. If you try to produce your own cards of this type be sure that the rivet is put properly. If it’s placed loose the upper part will move too freely and this will spoil the overall effect. The paper we used is 300 grams and there is 30 microns laminate over it. 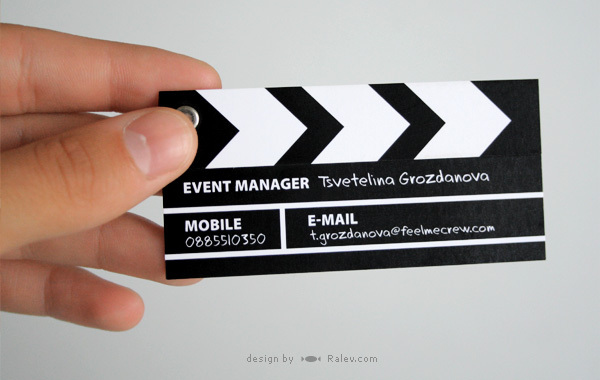 Being hard and solid is very important for this specific design of business card. 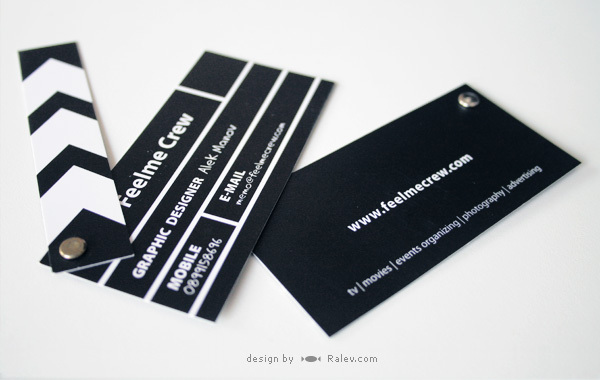 This original business card was designed by Ralev.com in back in 2008 and featured for the first time in 2010 in Smashing Magazine. Design adaptation with your new company details, production and international shipping is 380 USD for 500 cards (minimum order). Please use the form bellow to claim your set of creative business cards.